Julian of Norwich’s Revelations of Divine Love did something no other piece of medieval literature has done to me. It stirred up a lot of emotion in me; I had, I’ll admit, a lump in my throat. 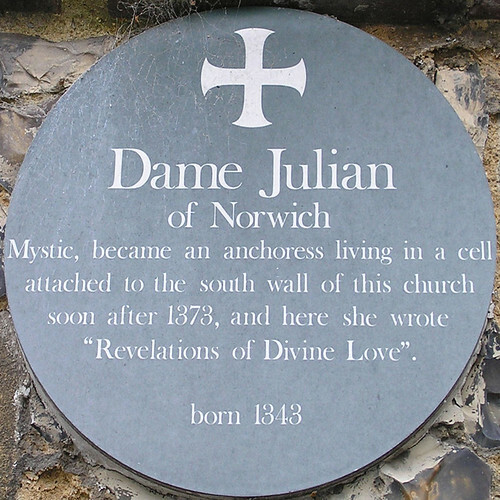 When she was young, Julian of Norwich prayed to God for a vision. She wanted more knowledge of the suffering of Christ; to know how those closest to him felt, watching him dying on the cross. She wanted to think she was dying, for everyone to think she was dying, so that she had no reason to think she would live any longer; but to not actually die. At the age of thirty-something, her prayer was answered. She suffers a fever; can’t move, can’t speak; can hardly breath. At one point, her mother closes her eyes, thinking she’s dead. A priest and a young boy from the town visit, to say the last rites. The priest holds a crucifix with Christ on it in front of Julian, and she has a vision. A series of showings from God himself. She goes on to recover, just as she asked, and she becomes as anchoress. Anchorites and Anchoresses were common in Medieval England. People thought that they were the anchors of the church (actually, the word means recluse, but we’ll forgive them the mistake). Essentially, a man or woman spent their life walled inside a room which they were to never leave again. Here, they would pray for the community, and the church would feed and clothe them. Today, this might seem like a lose-lose situation. The anchorite or anchoress can never go outside again, while the church has to pay for them for the rest of their life. However, at the time they were popular. The community would be saved, the church would be seen as saving the community by providing this. Anchoresses could live without getting married and without starving (which was nigh-on impossible at the time). The vision of Julian of Norwich is one of the most emotional things you can read. It’s full of the absolute heart-wrenching sorrow at the death of Christ, contrasted with the utmost joy of salvation and at the love of God. It’s also written in the most self-depreciating manner possible. She is “a woman, ignorant, weak and frail”. She is a “wretched worm”. That a woman, so intelligent and such a wonderful writer, could have such a low self-esteem, makes me sad. It tinges the whole book with melancholy. Despite being an atheist, I found Revelations of Divine Love incredibly moving – it’s well worth a read. It’s written in simple, understandable English. She takes the reader by the hand and walks them through her visions in the gentlest, most cohesive way possible. It’s simply beautiful. Great post. Come back soon. I’m currently midway through my exams, so I’m focusing on them too much to write on here. I have 6 hours of exams today! I’m finished next Wednesday, so I shan’t be away much longer!